China’s economic growth during the past three decades has been dazzling. During this period, the country has lifted an estimated 650 million people out of poverty. The speed and extent of this growth is unprecedented in human history. Viewed from any direction, this has been a remarkable transformation. This breakneck growth, however, has been achieved at considerable environmental and social costs. Among these are extensive air, water and soil pollution. And as people’s standards of living have increased, they have become more aware of the potential impacts of air, water and soil pollution on their quality of life. In the area of water pollution, much of the discussion in China and the rest of the world has been focused on special situations such as the floating of some 16,000 dead pigs in Huangpu River, which supplies the city of Shanghai with some of its drinking water. However, serious discussion on how to provide China’s 1.35 billion people with clean and safe water, that is water which could be drunk from the tap or source without any adverse health impacts, is conspicuous by its absence. As regular visitors to China, we have not met a single family that drinks water from the tap without boiling or additional home treatments. The distrust of the quality of tap water can be seen by the sale of bottled water. Between 2005 and 2012, China doubled its share of the global bottled water market. In 2014, China is expected to overtake the United States as the largest market for bottled water in the world. By 2020, it is estimated that China’s bottled water market will be $68.6 billion, the biggest in the world. China is not a water rich country. Although it accounts for nearly one-fifth of the global population it has only about 7 percent of the world’s freshwater. This does not mean that China does not have adequate water for drinking, industrial, agricultural and energy-related uses. It means that a new mindset is necessary to govern and manage China’s water, as it is becoming increasingly more polluted and scarce. China already has the technology, management, technical expertise and financial resources to make this possible, but it will only make limited progress with the existing mindset. What the country needs is a blue revolution in terms of water governance where increasing supply is not the automatic answer to an increase in demand. One important option is water pricing, which is too cheap at present. Consequently, households and industries use too much water: far more than needed. This is also the case for agriculture, which is by far the largest user of water. Neither municipalities nor industries have historically considered extensive treatment and reuse of wastewater. 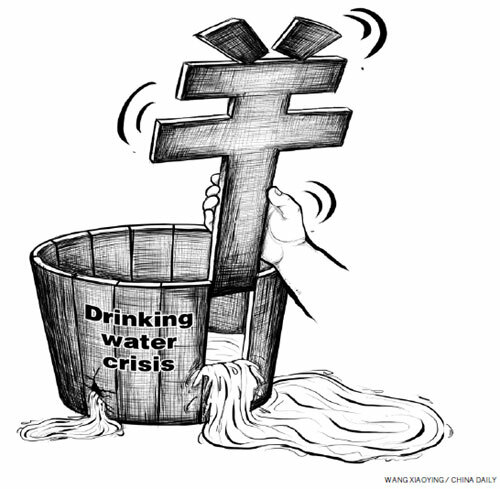 At present, water expenditure of an average Chinese household is about 0.5 percent of disposable income. This is one of the lowest in the world. The average water price for 25 major Chinese cities is only $0.46 per cubic meter, compared to a global average of $2.03 per cubic meter. Last November, China’s leaders discussed the country’s high rates of resources use, including water, and promised the market would play a greater role in setting prices and sector reforms. Accordingly, by 2015, there will be a three-tiered pricing structure in all cities and towns based on actual water use. The top 5 percent of water users will pay three times the base price. The next 15 percent will pay 1.5 times the base price. However, 80 percent will continue to pay the same cheap price. While the new pricing structure is a step in the right direction, it is not enough to manage demand. The water price has to increase significantly to manage demand. Our general view is that water price should be around 1.5 percent of disposable household incomes. Only those households where it exceeds their income level should receive targeted subsidies. However, increasing the price of water without improving services is not a feasible option, because the public will not accept it. Within the next five to 10 years, the objective should be to ensure all cities with a population above a certain level, for instance above 200,000 people, receive clean water which can be drunk safely from the tap. Concurrently, public awareness campaigns, such as those in Singapore, that focus on the importance, value and security of water for people’s quality of life and the country’s continuous economic development should be considered. People should be made aware that the cost of poor water supply and wastewater treatment is probably now around 2.5 to 3.0 percent of the country’s GDP. With cheap pricing, as has been the case historically, there can only be limited water conservation. This has also stopped companies, public or private, from carrying out badly needed upgrades, and proper and regular maintenance of their systems, and enabled them to delay applying the latest and best practices and technology to improve water governance and management. China is a vast and heterogeneous country. There is no single silver bullet that will improve domestic water supply throughout the country. However, proper water pricing is one of the most important tools available to ensure every Chinese has access to safe water in the foreseeable future. Like any tool, water pricing has to be used sensitively and properly. Cecilia Tortajada is the President and co-founder of the Third World Centre for Water Management, Mexico. Asit K. Biswas is the Distinguished Visiting Professor of the Lee Kuan Yew School of Public Policy, and co-founder of the Third World Centre for Water Management. One of their recent books is Singapore Water Story (Routledge, 2013), which is now being translated into Chinese and Japanese.